Whether it is zorbing in Sydney, Melbourne, Brisbane, Perth, on the Gold Coast or elsewhere in Australia, getting inside a zorb ball is terrific fun. Zorbing is an experience you can share with friends and family alike and is a great way to see some of the most beautiful locations in Australia. Experience the thrill of zorbing your way down a hill. It's fun and a zorb ride is certainly something you'll never forget.Zorbing on the Gold Coast, Darwin and Adelaide is definitely something you should put on your to do list while holidaying. Are you up for the zorbing challenge? Get involved today and you'll have a great time insode your very own zorb ball. Zorbing is guaranteed to be like nothing you have ever experienced before. A giant 3 metre PVC ball, round and bouncy, you jump inside it, it rolls and so do you! There are two different ways of Zorbing one involves getting wet and one doesn't, simple! Let your family loose inside a giant 3.5m PVC ball and go for the ride of your life! 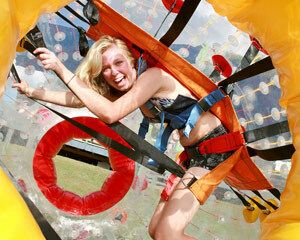 Your OzBall Zorbing ride will be like nothing you have ever experienced before. Up to three people roll down our custom-built track in a water-filled ball. Zorbing is simple and loads of fun. Challenge yourself and your families senses and roll over the edge of our custom built slalom or down hill speed tracks in a 3 metre huge PVC ball, round and bouncy, you jump inside it, it rolls and so do you! There are two ways to go Zorbing one involves getting wet and one doesn't, simple! Challenge your senses and roll over the edge of our custom built slalom or down hill speed tracks in a 3 metre huge PVC ball, round and bouncy, you jump inside it, it rolls and so do you! There are two different ways to go Zorbing one involves getting wet and one doesn't, simple! Challenge your senses and roll over the edge of our custom built slalom or downhill speed tracks in a 3 metre huge PVC ball, round and bouncy, you jump inside it, it rolls and so do you! There are two different ways of Zorbing one involves getting wet and one doesn't, simple! Take your family zorbing a unique adventure where you are loose inside a BIG, fat, 3.5 metre PVC ball rolling down a hillside - a total Adrenalin rush! Zorbing Rides are an unique adventure where you are loose or strapped into a BIG, fat, 3 metre huge PVC ball, and then launched down a hill.